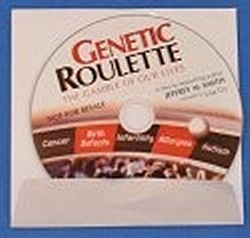 Genetic Roulette Documentary (2012) Never before seen evidence points to genetically engineered foods (GMO) as a major contributor to rising disease rates in the US population, especially among young people. Gastrointestinal disorders, allergies, inflammatory disease, and infertility are just some of the problems implicated in humans, pets, livestock and lab animals that eat genetically modified foods. This film is free for orders over $100 or you can buy it or extra copies at a substantial discount here.